Sale time and they're here! We have decided to go ahead and release our specialty leather collars. We will gradually be growing the leather color line within the next month. We have black and brown leather on order and on its way here. Please punch in code:New20 for 20% off your specialty leather collar order. From today through Sunday! Also, we added a few more limited availability colors, including: Green Metallic, Penny Metallic, Pink Metallic, Lime Green Metallic, Turquoise, and Magenta to the leather color list. We are gearing up for a new line of designer leather collars. 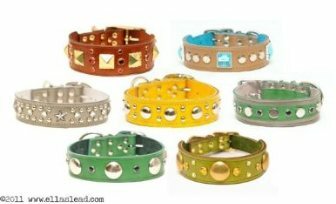 We are beginning to offer stitched leather collars. Following this roll-out will be custom leather embroidery. This is a very exciting time! All current and past offerings will continue, so no worries.